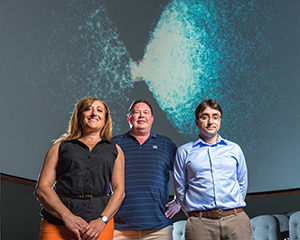 University of Notre Dame astronomer Timothy Beers and his Galactic Archaeology group, which includes Notre Dame astronomers Daniela Carollo and Vinicius Placco, have led an international team of researchers that produced the first chronographic (age) map of the halo of the Milky Way galaxy. The halo, along with the disk and bulge, are the primary components of the galaxy. Using a sample of 4,700 blue horizontal-branch (BHB) stars from the Sloan Digital Sky Survey, the research team showed that the oldest stars are concentrated in the central region of the galaxy, confirming predictions from numerical simulations of galaxy assembly. The researchers have also shown that chronographic maps such as theirs can also be used to identify complex structures of stars still in the process of being added to the halo system of our galaxy. The researchers used the colors of BHB stars, which burn helium in their cores, to produce the age map. The technique relies on the fact that the colors of BHB stars are related to their masses, which in turn are related to their ages. The research results allowed the team, for the first time, to demonstrate two primary results. The researchers have also resolved the ages of dwarf galaxies and their stellar debris, which was stripped from them due to their gravitational interaction with the Milky Way. The researchers used stars with spectroscopy collected during the Sloan Digital Sky Survey, and from that, they determined the parameters that allow them to efficiently separate the BHB stars from other kinds of stars. From that, a relatively pure sample could be obtained, enabling a clear age map to be made based on their colors. The results extend and refine some prevailing assumptions in astrophysics. 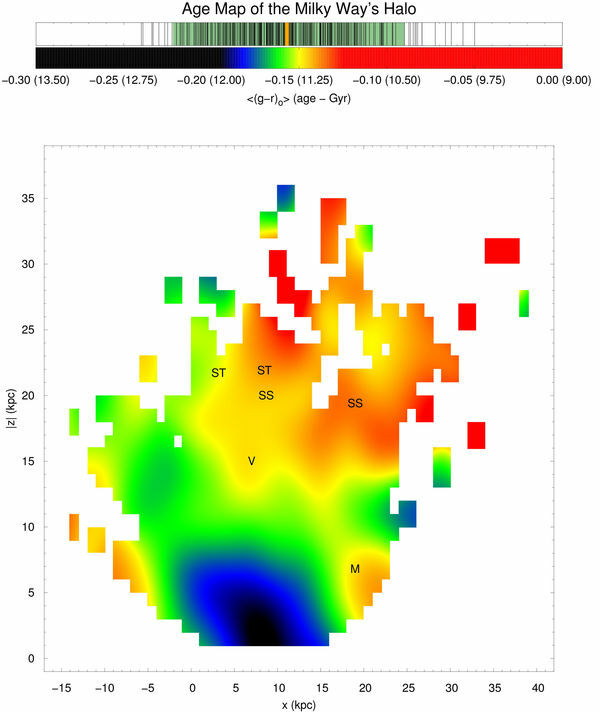 Beers’ Galactic Archaeology group at Notre Dame is now preparing a much more extensive age map of the galactic halo based on hundreds of thousands of BHB stars, also from the Sloan survey. The group’s next detailed map will serve as a guide for astronomers to identify numerous new dwarf galaxy debris signatures and enable the development of a refined history of the assembly of the Milky Way. The paper appears in the Astrophysical Journal Letters and can be viewed here: iopscience.iop.org/article/10.1088/2041-8205/813/1/L16. Originally published by Notre Dame News at news.nd.edu on October 28, 2015.